Posted July 8th, 2014 by Berkley Human Services & filed under Risk Control. Fire and life safety risks affect virtually every human services organization. The hazards and challenges related to such risks can be wide ranging and, consequently, can impact how your organization is evaluated from an insurance underwriting and loss control standpoint. How well does your organization assess its fire and life safety exposures, and address them from a risk management perspective? Building Age: Older buildings may have older, less fire retardant, and more failureprone construction materials, electrical and mechanical systems, and evacuation efficiencies. 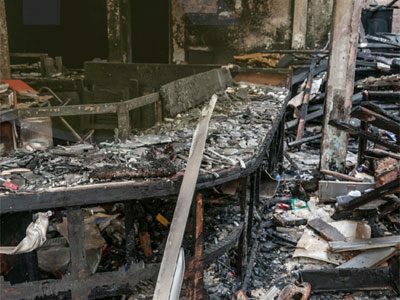 Because these factors can influence fire ignition and life safety response risks, it’s important that these be addressed with frequent inspections, maintenance, and required or suggested updates. Not doing so can lead to greater risk of loss. Occupancy: Certain tenancy and user occupancies can raise fire and life safety risks. For example, residential occupancies often have greater tenant smoking and cooking risks; and sheltered workshop or supported employment activities may have higher machining and processing risks. Early detection, prevention and suppression, and appropriate evacuation plans can be very important to reducing certain occupancy-related risks of fire loss. Combustible Loading: Interior finishes, furniture, stock, chemicals, and numerous other elements can fuel the ignition source, spread fire, and impede effective life safety responses. As such, occupying spaces (or buildings) with more combustible construction materials (e.g., wood frame versus concrete structures) and contents can raise your fire risk. Consider how to potentially reduce the concentration and volatility of such risks. Consider also that a building – and its related occupancy and combustible loading – may undergo numerous changes or alterations during its lifespan that could impact critical fire-related components and exposures. Consequently, we encourage you to make sure that periodic and appropriate fire and related life safety protection system inspection, testing, and maintenance occur through qualified resources in buildings your organization owns or occupies. Devastating injuries and loss of life certainly can occur with fires. As such, your organization should not only know how to appropriately alert its clients, volunteers, and staff about a fire in a building, but also how to get everyone out of that building timely and safely if a fire occurs. This is particularly critical if your organization has residential or other buildings where assemblies of people may gather. Think of your organization’s Life Safety Plan as a valuable tool that: (1) is well-understood, periodically tested and maintained, and frequently revised to reflect changes in your organization; (2) may help improve or reduce your organization’s risk exposures; and (3) can enhance, ultimately, your organization’s mission and save lives. Although the list above is not exhaustive, looking for and providing appropriate solutions to these hazards may improve your organization’s overall fire risk profile. Additional resources on this and other risk management subjects are available to insureds through our Human Services Program. Visit our website at www.berkleyhumanservices.com/risk-control, or contact our Risks Control Department at 612-766-3100 or [email protected].